We have been enjoying a wonderful time here in Kenya, East Africa. Our village is called Nyangidi, sub-location Kochieng B in a county called Siaya, which borders the Great Lake Victoria (the beginning of the river Nile). We are in the very West of Kenya, close to the countries Uganda and Tanzania. People here are of the Luo tribe and most live in mud or mud-brick homes with grass thatched or iron sheet roofs. It has been a long dry season since November and so most of the grass has disappeared to dust and not much food is growing. We hope that in future years, more permaculture knowledge and access to infrastructure such as swales, rainwater tanks and dams can help store water in the area and provide food even in times of drought. 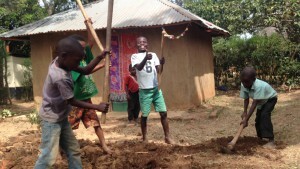 Local kids (use their new tools to dig a garden in the dry soil. In late January, after the teacher strikes in Kenya ended, most children resumed school. Since then, during the weekend writing days many children have visited us to collect their letters from Australia, receive a gift and write their reply letters. They also played with the Community Classrooms new educational resources, ate snacks such as fruit and yoghurt, sang both English and traditional songs, and participated in some yoga, dancing and ball games. Jojo slowly pulls things from his box as his friends watch in anticipation. The word of Australian pen-friends has travelled to neighbouring Sogo village and 20 new pen pal children have been welcomed to the program. 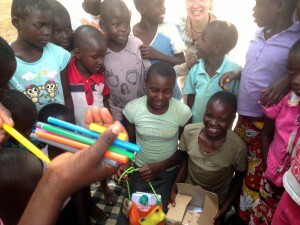 After writing their letters the children posed for a photo and received exercise books, pencils and pens. We are working with the new project manager for Community Classrooms Collaborative, a local village elder, to develop some guidelines for gift giving and personal requests in letters. This last letter-round some children from Australia sent shoe-boxes full of gifts to their pen pal, but because there were so many village children and only a few boxes we encouraged the children to share the gifts inside and also had an extra bag of goodies (clothing, shoes and stationary) to make sure that everyone received something. 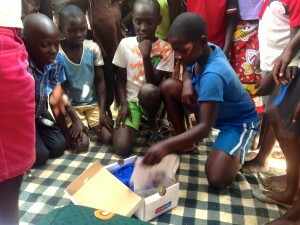 Children of Nyangidi village open boxes of gifts from their pen friends in Australia. Although everyone received something, unfortunately not all gifts were created equal and some children saw that others got ‘more’ or ‘better’ than what they did (the balls, storybooks and packs of Faber Castell pens were a BIG hit). This has resulted in some children (especially the new ones) ‘asking’ for things in their letters. So our apologies if your pen pal has requested something in their letter and it makes you feel uncomfortable. 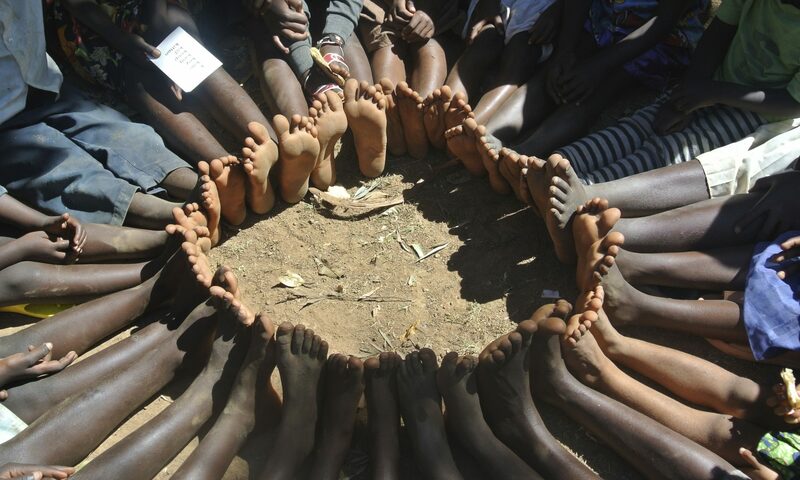 In the Luo culture people can freely ask each other to give them things without attachment or expectation that the thing will actually be given. I know it is different in Western culture where we do not usually ask things of each other and if someone does ask we often feel obliged to give. We are working with the children to be more culturally sensitive and write about what they like, have or don’t have and not just what they want to receive. We also want to empower them instead of providing handouts, which can imprison people into cycles of dependency. We are treading lightly and want to introduce things slowly and observe how the community responds. Perhaps minimal personal ‘stuff’ and more collective ownership or investment in community projects is the way forward. Many children crowd around to look at the colouring pens and clay. 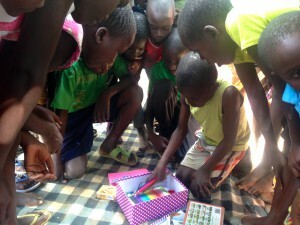 We have created a Community Classrooms library where children can come to read books, explore various learning posters, use colouring pens and pencils, paints and even play with instruments, board games, puzzles and different sports balls (volley, soccer and netball so now we just need to make goals and nets). Teachers in the local area have also been invited to borrow resources from the library for their classes that are usually extremely full of students and under-resourced. 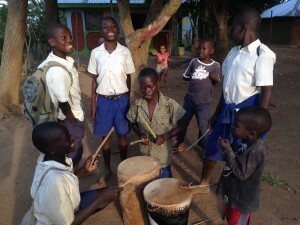 Local children love playing the new traditional drums Ohangla style. Many children have written that they are in ‘standard x’ this refers to their grade or year level. Primary school here goes up to year 8. Children are held back until they know what is required to progress to the next level so many are 16 before they finish primary school. High school is called form 1-4 but a large number of children are not able to attend due to lack of school fees and necessary money for uniform, books and transport. Some older siblings helped write letters for the younger children who wanted to participate in the program and are still in nursery or pre-school (they call it ‘baby class’ or ‘final’). This is actually a small brick building set slightly away from the other classrooms. They are lacking resources but Teacher J (with her small baby at the back of the class!) does an AMAZING job with admirable enthusiasm to sing, dance and teach the basics to around 70 small children of age 3-6 years. On our last visit she had 7 pencils to share around the children (with innovation they sharpened both ends and snapped them in half) though many children still wrote their letters and numbers in the dirt. We hope that the library can be a useful tool to make learning more colourful and fun for these children. Lots of children wrote about food in their letters. They all love fruit but often do not have access to fresh fruits and vegetables, especially during dry seasons. There are many mango trees in the village so during mango seasons they delight in climbing the trees (ever tall ones over 3 stories high!) and finding fresh juicy mangoes. They also have jackfruit and guava trees in addition to banana plants. We are planting more of these and are looking for other types of trees (such as the moringa), vines and vegetables that will hopefully do well in this area. Special care is being taken to preserve and promote indigenous varieties such as cassava and many species of dark leafy greens. 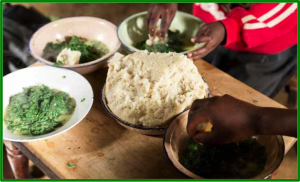 Delicious and nutritious ugali with greens. 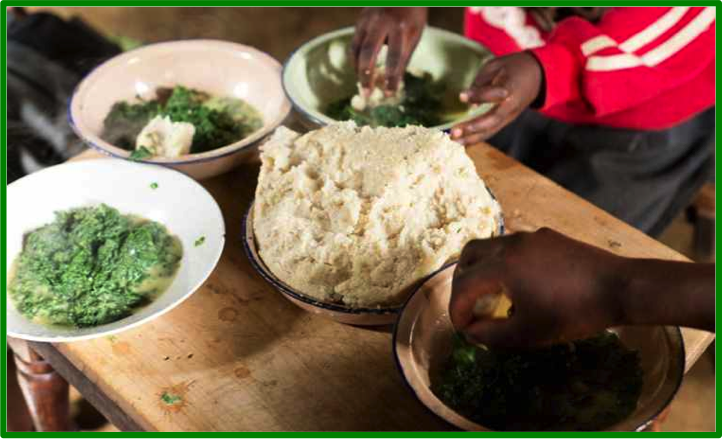 A staple food in Kenya is ‘ugali’ and many children have written about this in their letters. Ugali is made from maize or cassava and millet that is grown locally, and then ground up into a flour. They heat water over a fire or charcoal stove called a ‘jiko’ and mix the flour in until it becomes a play dough consistency. This is a tough job, especially when you are cooking for many people. The ugali is eaten with a range of things and used instead of cutlery. People make a ball with it in their hand and then use that to scoop up their main meal which may be something like beans, fried cabbage, cooked bananas in a tomato soup, egg stew or fish. Many children were so very happy with the letters and gifts they received, they replied that they would like you to come to Kenya so they can cook a big chicken for you to eat and enjoy (sorry to any vegetarians out there!) This is a cultural honour that they reserve only for special guests and visits from important family members, chicken is not eaten regularly as they are more valuable for their eggs and manure. Along with the other Community Classrooms projects we have been empowering and providing hope through the support of sports teams. Children at Osoro and Kochieng schools LOVE their new uniforms and balls. They wore them with pride and I am sure their game and teamwork improved immediately. If you know of any local sports teams who would be interested in sponsoring or doing a raffle fundraiser for uniforms and sports equipment for children in Kenya then please be in touch. Children at Kochieng Primary with their new sports uniforms and ball. We hope to provide exposure and exciting experiences for children of the Rafiki Pen Pals Program, such as an excursion to the national park to see their unique animals like giraffe, zebra, lion, rhino, elephant, monkey and others. Very few children from the villages have the opportunity for these experiences and there is much evidence to suggest that environmental protection and care comes from appreciation. We would like to cultivate this appreciation of the natural environment in the early years through transformative youth empowerment, with the hope that it will flow through into the future to create conscious global citizens who will care for our planet Earth. 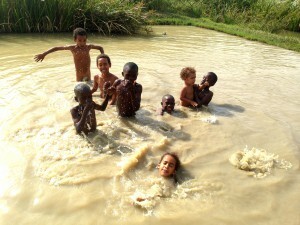 The village children LOVE swimming on hot days but they only get to splash about in the filthy fish ponds (if the owners are not looking!) When we have shown them photos and movies of oceans and swimming pools in Australia their mouths open wide in disbelief. We hope to also take them on excursions to the Great Lake Victoria and a swimming pool in the closest city of Kisumu. These trips will be planned in the future when we have raised enough funds to hire a bus and cover the other costs such as food and accommodation. Thank you for all of your continued support in our sustainable community development initiatives. We are proud to promote poverty alleviation through sharing cultural celebration! If you have any questions or ideas on how to improve the program, or if you would like to volunteer some of your time to help with coordination, promotion, fundraising or letter writing, please be in touch. Samantha Willcocks, the Community Classrooms Team and families of Nyangidi village.